Increasing clouds but mostly dry. What a gorgeous evening! High clouds will slowly increase tonight well ahead of a storms system which is over Texas this evening. 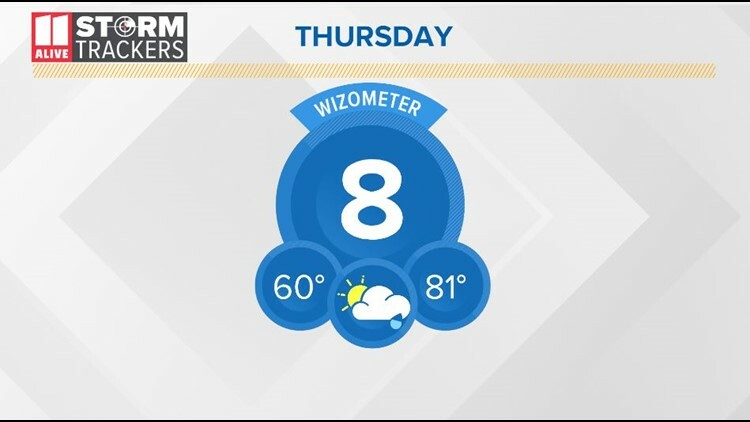 Thursday we will continue to see increasing cloud cover, but that won't stop highs from getting into the lower 80s again. Showers and storms arrive maybe as early as the evening commute. We will have scattered showers and isolated thunderstorms continuing through Friday as a cold front moves through. That is our only rain chance for the 7-10 days. Windy conditions will develop in the wake of the cold front. Winds will gust out of the northwest up to 30 mph. Temperatures will be cooler Friday with highs in the mid 70s. The weekend looks great with highs in the 80s with sunshine.